I love coffee, tea, red wine, tomato sauce, diet soda and about a zillion other things that can yellow the chompers. Equal to my love of yellowing agents is my love of teeth whitening solutions, and I have tried lots. From old school products that used to be advertised while I watched The Love Boat with my grandma, to specially-fitted trays from my dentist and in-office UV light treatments, I have tried them all. 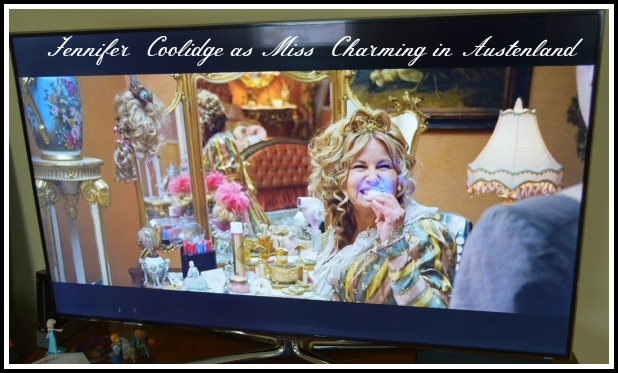 The only thing I have not yet invested in are fake teeth or that handheld light thing the brilliant Jennifer Coolidge’s character used in Austenland. Right now I am using some super affordable and time efficient whitening products from Rembrandt. 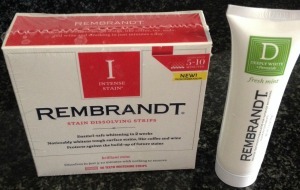 The Rembrandt Stain Dissolving Strips are white strips that melt away in five to ten minutes. No more sitting around with stinging teeth for half an hour! And the Rembrandt Deeply White + Peroxide toothpaste actually whitens my teeth, and not just my black t-shirts when I do a sloppy brush. It is also safe on teeth enamel and even works to restore our natural tooth protectant. These products are available at grocery and drug stores, which makes them easy on the schedule and wallet to pick up. We can also save even more by visiting the Healthy Essentials website this month and receiving coupons like $3 off any two Rembrandt Whitening items. You can use that $3 to rent Austenland.